Download Horoscope 2019. Android app with Daily Horoscope 2019. 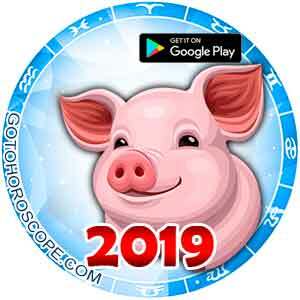 Download 2019 Horoscope App, a mobile App designed for 12 Zodiac signs with visual 2019 Horoscope for the Year of the Pig. Everybody, even pronounced skeptics, wants to look into their future. You can arbitrarily reject astrology, but the thousand-year experience of the inhabitants of the planet Earth proves that astrology really breaks the veil of secrets over our futures. The secrets your destiny is fraught with each day will be reported by the convenient and functional application Horoscope 2019. You will have your own personal astrologer as soon as you download the application on your mobile device. This will help you to learn about everything that prepares today, tomorrow and every day. In the mobile application, you will find a capacious but informative horoscope about everything that awaits you during the week, the month, and the entire year. The twelve-month period will no longer seem mysterious, covered with a veil of fog, as soon as you have the app in hand. Representatives of each Zodiac sign will find a forecast about everything that is waiting for them in the most important spheres of life in 2019-love, health, work, money. Each of these aspects is highlighted in the horoscopes, solely to make your life easier and more comprehensible throughout 2019. The horoscope application has a bright design that improves your mood and provides a lot of positive emotions. Is this not a real salvation from depression for modern people living at a rapid pace who don't have time to search for decent sources of positive energy? Most importantly, the Horoscope application for 2019 breaks the well-established stereotype that the astrological forecast is only a text modern people rarely have time to read. The application contains a colorful horoscope video. Audio visualization will open up new sides of astrology, save time, and create a unique attitude. The app will serve as your personal travel guide through the winding paths of life.